c.1977 & 1978? | age 9 & 10? This is a messy but funny looking page. But then, it’s not like… MARK HAMILL’s gonna see it. Is he? Mark Hamill knows this comic exists! That’s it—fortune awaits! Hmmm… I wonder which of my pictures of Leia he was referring to? Most of them are hideous! Well, no matter. Can you imagine if my 9 year old self had known that his hero—Luke Freaking Skywalker!—would see his comic some day? Can you? Can you?!? Me, probably reading a Star Wars Annual c.1978? My hero looks down from the wall. And many thanks again to Neil! He’s finishing a major personal animation project now: Small Sacrifices, which will be hitting the festival circuit. (written a couple of years ago). So please check out the trailers, and enjoy the official website – the Production Gallery is very funny! but then, this is Neil Baker – right? Click to see the different Stages. It’s a veritable multimedia extravaganza! Today’s page is a hybrid-curio. It’s a very early one, but was subsequently tweaked. It must have been quite weird looking! Luke seems to have had a big tall head; we’ve seen a few of those: like «here and «here; and those odd diamond-shaped eyes. Chewie’s been copied from a Star Wars Weekly Comic pull-out poster or the trading cards ‘jigsaw’ puzzle. Do you see part of the Millennium Falcon behind his head? It’s funny, Chewie seems to be back standing in the Death Star hangar! What’s he doing there, at a time like this? 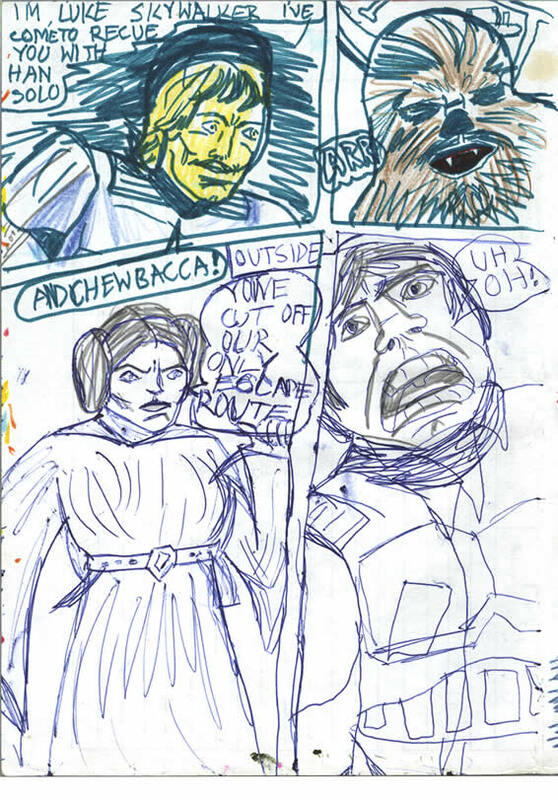 It starts in green felt-tip, but then Leia and Han are drawn in biro, then pencil! Han looks like Javier Bardem in a hall of convex mirrors—or the Hulk! I later made his mouth a bit smaller in pencil. What a weird drawing! And wait… there’s more: Han was dressed without his trooper armour. How could I forget that detail when I made the page? Have a look at the stage-by-stage animation of the drawing of Han. I think I realised my error in omitting the trooper armour before I finished drawing Han’s waistcoat.